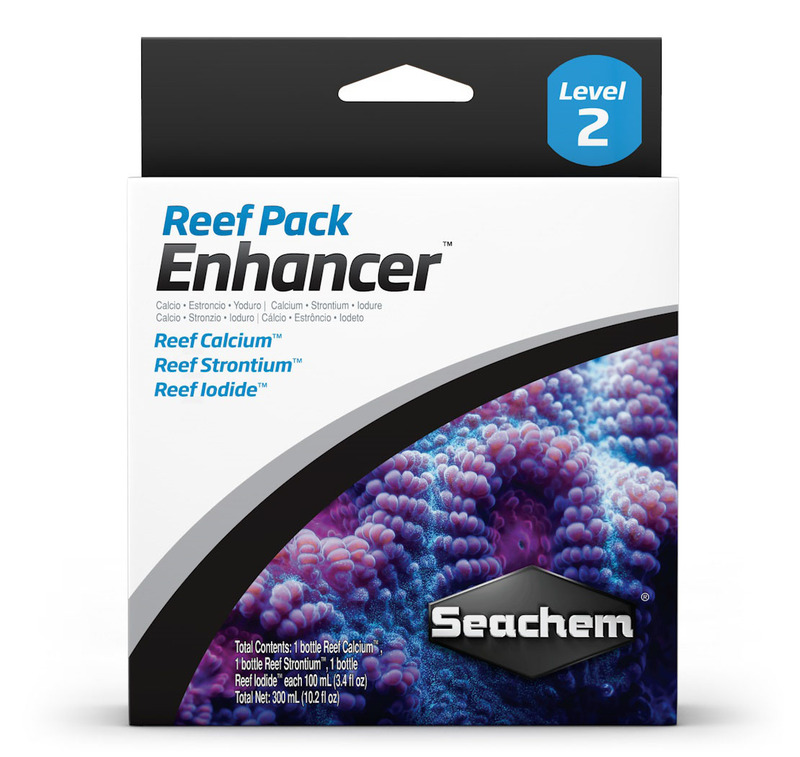 The Enhancer Pack combines those products essential for any reef (Reef Complete®, Reef Carbonate™, and Reef Plus™). Reef Calcium™ is a concentrated (50,000 mg/L) bioavailable polygluconate complexed calcium intended to maintain calcium in the reef aquarium without altering pH. Polygluconate complexation confers several benefits: it increases the bioavailability of the calcium, it provides a rich source of metabolic energy to help maintain peak coral growth, and it prevents calcium precipitation/alkalinity depletion. Polygluconate contains no nitrogen or phosphorous, thus it is biologically impossible for it to lead to algae growth in a properly maintained reef system. Reef Calcium™ may be used alone to maintain calcium but will provide enhanced levels of coral growth when used in conjunction with an ionic calcium supplement (Reef Complete®, Reef Advantage Calcium™). Reef Calcium™ is intended to maintain calcium levels; if calcium becomes seriously depleted one should either perform a water change or use an ionic calcium supplement to restore the depleted level of calcium. Reef Strontium™ is a concentrated (10,000 mg/L) gluconate strontium supplement for the reef aquarium that will restore and maintain strontium to levels found in natural sea water. It is most useful in densely populated aquariums requiring a continuous supply of strontium. It has a pH of 8.2 and is neither acidic nor caustic. Reef Iodide™ is an iodide supplement for those with dense populations of invertebrates or soft corals. It is also useful in tanks with aggressive skimmers. Reef Iodide™ is concentrated at 8,000 mg/L. As little as 1 mL in 160 liters (US 40 gallons) will raise iodide to natural seawater concentration. It is formulated to provide a safe source of iodide that will not convert to toxic free iodine under storage or reef conditions. It is recommended that this product be used with the MultiTest™ Iodine/Iodide test kit to ensure proper maintenance of iodide levels. 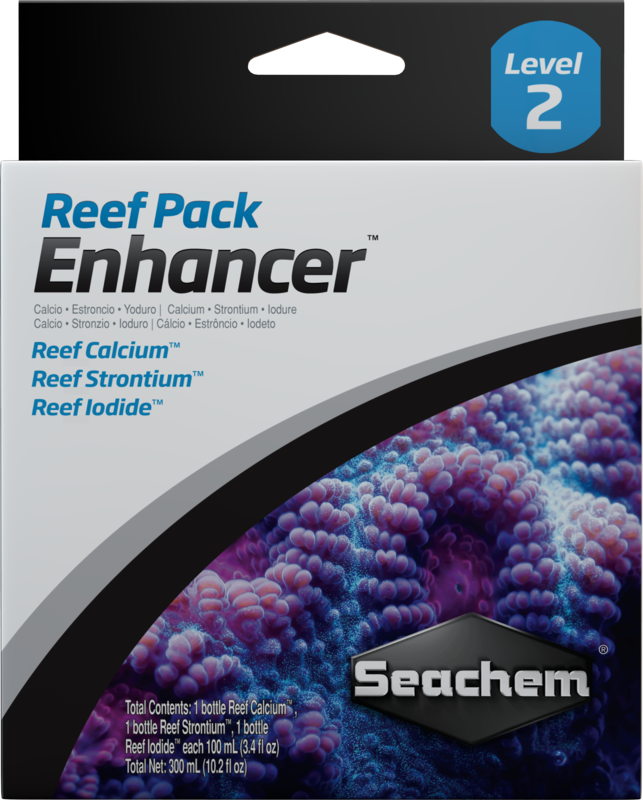 There are no questions for Reef Pack™: Enhancer. Ask us a new question.